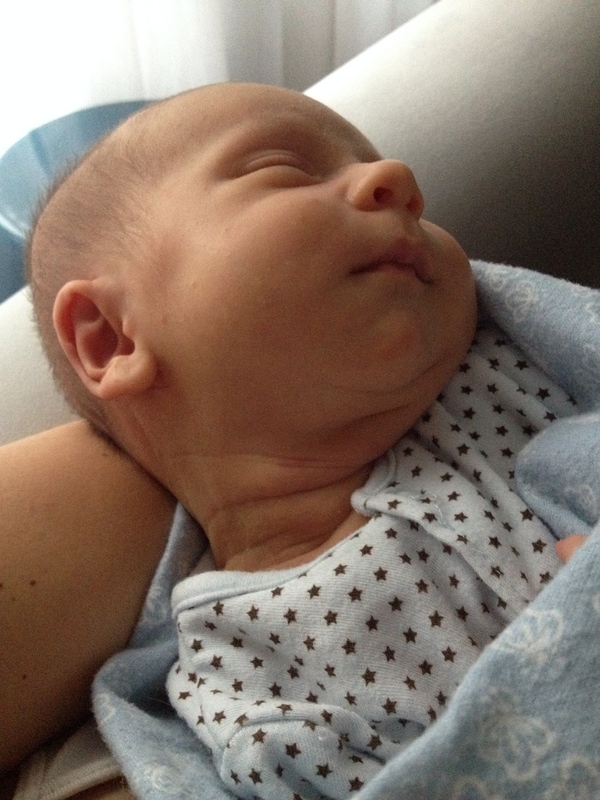 Before Joey was born, there was NO question in my mind about his initial nutrition: I was going to breastfeed. I think one of the first things I learned while studying to become a registered dietitian was “breast is best for baby!” That catch phrase didn’t prepare me for the struggle that breastfeeding turned out to be. It was HARD. A lot harder than I had anticipated. But a certain someone made the experience easier. No, it wasn’t the lactation consultants in the hospital or the tips and tricks I read daily from experts at BabyCenter and KellyMom. It was Joey’s Dad, my husband, Ted. To be honest, I wasn’t expecting his support to be the one that got me through the first month or two. What could a man possibly know about breastfeeding?! But I was delightfully surprised- and thankful for his daily encouragement and presence. Come to think of it, he’s my number one supporter for everything else in life. So why wouldn’t he be for breastfeeding?! 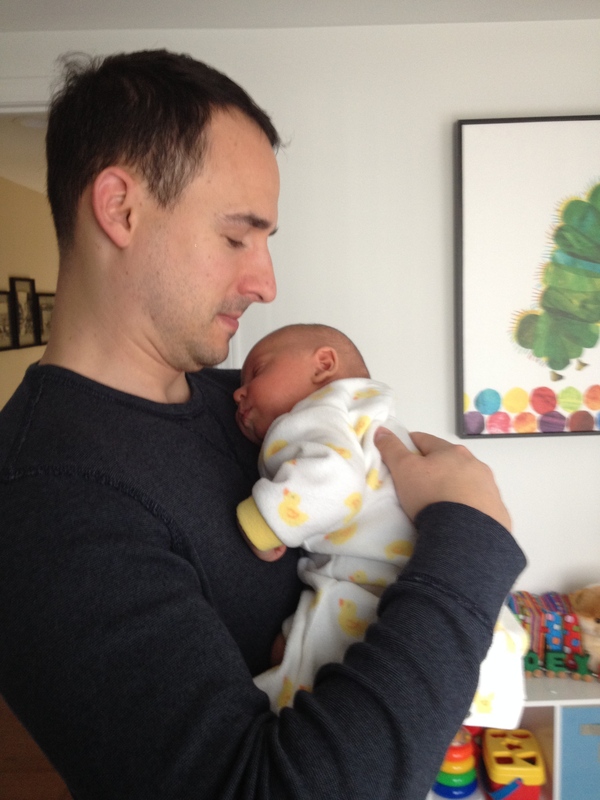 So here’s what I learned from Ted, and what I want to share with new dads about how dad can help with breastfeeding. 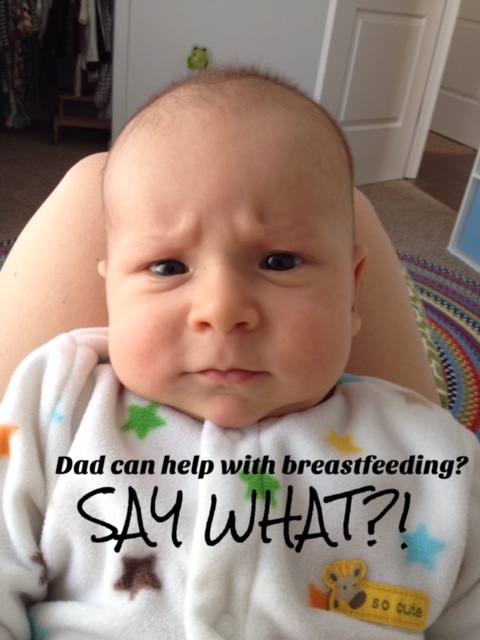 Dad’s get tired with breastfeeding too! 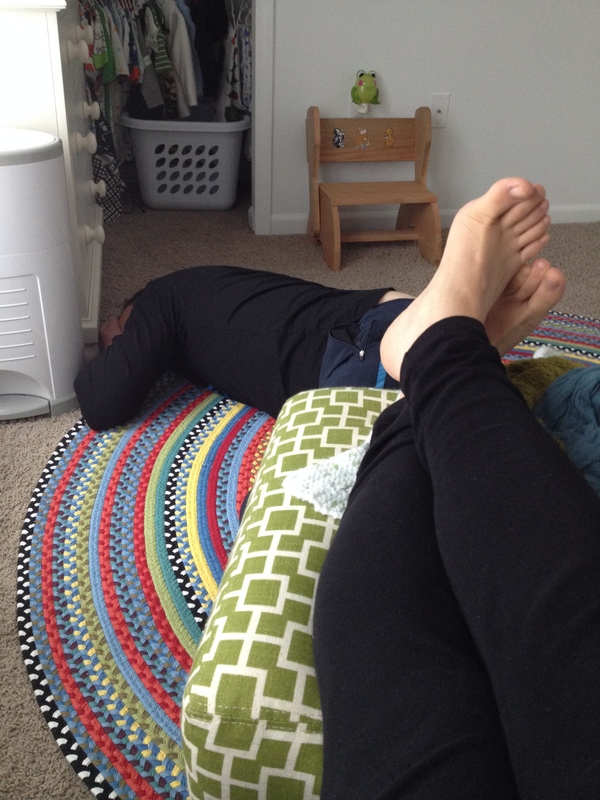 Especially if they help out a lot like my hubby did…. Dad’s can be involved in the breastfeeding process just as much as mom, even though they are not the one’s supplying the food. Although I’ve often thought breastfeeding would be MUCH easier if Dad was able to feed too! [He’ll likely spit out his coffee reading that comment]. Look, he pretty much has the position right. Don’t you think?! Help with positioning, burping, and diapering, especially the diapering!!! Breastfeeding is notorious for diaper blow-outs! Let your partner know you are proud of her and think she’s amazing, even when she hasn’t showered or brushed her teeth in 2 days. Spend time alone each day with your baby- go for a walk, splash in the tub during bath time, sing, dance, or read together. If your partner is pumping milk, offer to bottle feed baby at night or during the day to give mommy a much-deserved break [mainly for sleep or to eat a meal, uninterrupted]. Spend time alone each week with your partner- a continued connection with your partner will help with both of your moods and baby’s too! Lastly, if your partner isn’t breastfeeding, you’ll be husband of the year if you split bottle duty 50/50! When I stopped nursing Joey around 3-4 months of age, Ted would give him the bottles of formula when he was home and able to. Post-nursing cuddle time with Dad = the best time! A break for Mom too! Breastfeeding does take time and energy, especially during the first few weeks of your baby’s life. New moms, let your partner know how much you need their support as you both learn to care for your baby. And don’t forget your partner needs support too! Take him up on the offer for help… all three of you will benefit from the mutual family support system. A well-fed, loved little angel. Happy because Mom and Dad are happy too! I bottle fed, so my husband was equally involved in feeding my boys as I was. Thats a definite plus! I did after a few months and Dad pretty much did the same when he was home. TG! This is a great post! I kinda wish my husband was more involved in this process, I think unfortunately for me, its ended up with me being the only person to make meals for my children. Its grown from just breastfeeding to solids and now that they are three and five, my husband still does not feed the kids a meal. Its only me. Maybe if I had involved him more in the process, he would be more willing to prepare meals for the kids nowadays. I wonder…. Thanks, Heather! 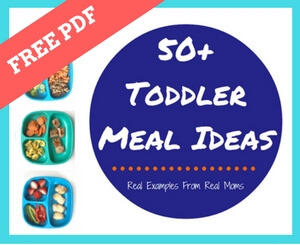 I honestly wonder how it will be with #2 since he’s an active, solids eating toddler. I might have a different perspective and post to share!! Yes…he can help with that diapering, indeed!! These are wonderful tips. I’ve breastfed for more than 10 years with all my kids. My husband was great about taking our youngest and spend time with her after nursing. These are some really great tips. I have heard a bit about how dads can feel like they are missing out on quality bonding time because they can’t always be that involved in the feeding process during infancy. The good news is once infancy is over dad’s can play an even bigger role in feeding!! And give us moms a break! 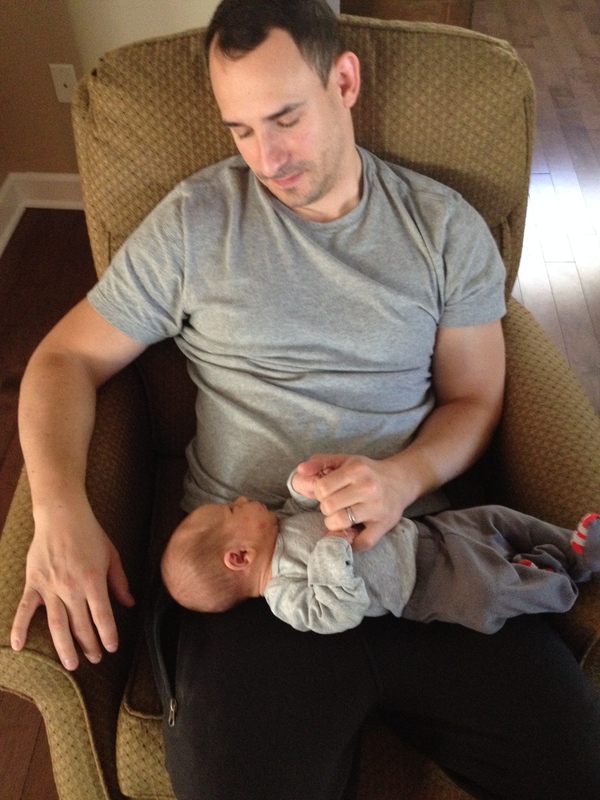 After my first few weeks of breastfeeding, I would pump a little so Daddy could help. He was always so supportive. Great post dads can totally be involved in breast feeding. It is so important for dads and babies to bond. Exactly! And this is one little way they can! This is a great way for both parents to bond with the baby and each other. I think fathers will appreciate being included too! I like these tips so dads can be involved. I’m not going to have anymore children but my daughter was bottlefed and her father was involved with feeding her. Can’t lie, sometimes I wish my baby would take a bottle. I have had a full night of sleep in months! Such great tips! I couldn’t have made it through breastfeeding without the support of my hubs! These are great tips! My husband and I are not just yet ready for babies – but when we are I will definitely remember this. Thanks! So true! Those words of encouragement kept me going on many a rough night in the first few weeks. Now we are bottle feeding from time to time, it gives my husband a chance to bond with our son and me a chance to take a long bubble bath!